The International Trophy was designed in 1947 by T.B Huxley Jones, F.R.B.S., principal of a school of sculpture at Aberdeen, who had spent part of his early years in Summerhill, Nr. Wrexham. It was an inexpensive trophy for the festival committee. Mr Huxley Jones generously gave his services and the Festival President W. Clayton Russon contributed the cost of casting copies of the trophy for each of the competitions. 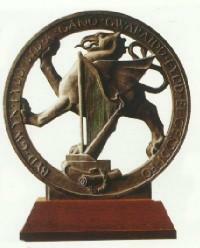 The Eisteddfod motto which is incorporated in the design of the Trophy (“Byd gwyn fydd byd a gano. Gwaraidd fydd ei gerddi fo.”) was composed by the Welsh poet Emeritus Professor T. Gwynn Jones, D.Litt., C.B.E. The Bronze International Trophy is awarded to winners of all major competitions. The International Medal is awarded to winners of solo competitions. Left:- The W.S. Gwynn Williams Trophy has been awarded since 1978 as a tribute to the Founder Music Director. It was designed by Charles Day and is crafted in silver and Welsh slate. Right:- A Diploma is awarded is awarded to each winning and placed group. Each diploma is personalised backstage by a volunteer calligrapher; Mrs B. Jardine did this work for over 45 years.